Monty Panesar, the chief guest at Friday’s Spenser Wilson Halifax League annual dinner, has not given up on reviving his county career. The 36-year-old, who fractured his ankle a year ago while training for the TV show Dancing On Ice, turned up at The Venue, Barkisland with his left leg still in a support. However, Panesar, a replacement for fellow ex-England Test player Philip DeFreitas, is determined not to draw stumps on his professional career. Panesar, in a question and answer session with local MC Pete Emmett, said he planned a cricket comeback next year. The ex-Northants and Essex player, who wrote to all 18 first-class counties in the summer offering his services, said his passion for playing the game was undiminished. Panesar, who played in 50 Test matches for England and has taken 193 international wickets, told an audience of 200-plus that he had particularly enjoyed playing alongside Andrew “Freddie” Flintoff during his England days. He also spoke frankly about his past mental health issues. The winners of a handful of special awards were announced on the night. Norden CC, whose thirds are now joining their other two seniors sides in the Lancashire League, were presented with a trophy for being “model” members of the Halifax Sunday League since its inception. The H Robinson Trophy for improved facilities went to Bridgeholme CC and was collected by Sharon Mitchell, partner of club stalwart Keith Hudson. Junior League supremo Phil Sharples, who presented the award, likened the ground surrounds at the Eastwood club to a stately home. “The floral beds are a table cloth of colour,” he said. The Heritage Award went to SBCI which is celebrating its 125th year anniversary. Sharples said the club continued to produce some of the area’s best players with its commitment to junior cricket. 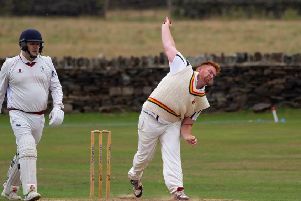 The umpires’ Sportsman of the Year Trophy went to Luddenden Foot’s Richard Pinder, who has also played for Sowerby Bridge, Bradshaw, Barkisland and King Cross in a lengthy career. Now the groundsman at Foot, Sharples said Pinder was: “A well-respected, tough competitor and a cricket traditionalist. Bradshaw won the Roy Smith Club Sportsmanship Trophy, based on marks awarded by umpires throughout the year, and the Simon Lees Memorial Trophy, presented by Paul Shannon, went to Greetland’s Les Forrester.